Large volcanic eruptions release huge clouds of ash and acid into the atmosphere. These clouds spread across the globe and block out the Sun, resulting in a colder climate for decades afterwards. Climate researchers have known this for a long time, but new research from the Niels Bohr Institute shows that the effects of volcanic eruptions are greater than previously thought and that they have influenced historical events over the past thousands of years. The results are published in the prestigious scientific journal, Nature. From the new volcanic reconstruction, it is seen that large volcanic eruptions in the high northern latitudes, such as on Iceland or in North America, often caused severe summer cooling in the northern hemisphere, and several historical events can be ascribed to the effects of volcanic eruptions. 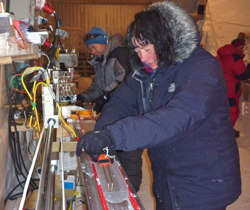 Researchers can read past temperatures in the ice cores drilled out of the ice sheets in Greenland and Antarctica. The ice is formed by snow falling year after year and is gradually compressed into ice. Each annual layer can tell about the temperature and climate conditions in the year when the snow fell. “The ice is an archive of past climate, but it is also an archive of past volcanic eruptions, as we can find traces of eruptions in the ice cores we drill out of the ice sheets in the form of ash and acid layers, which fell from the atmosphere with the precipitation,” explains Dorthe Dahl-Jensen, professor and head of the Centre for Ice and Climate at the Niels Bohr Institute at the University of Copenhagen, which leads the ice core drilling in Greenland. American pine trees can live for thousands of years. 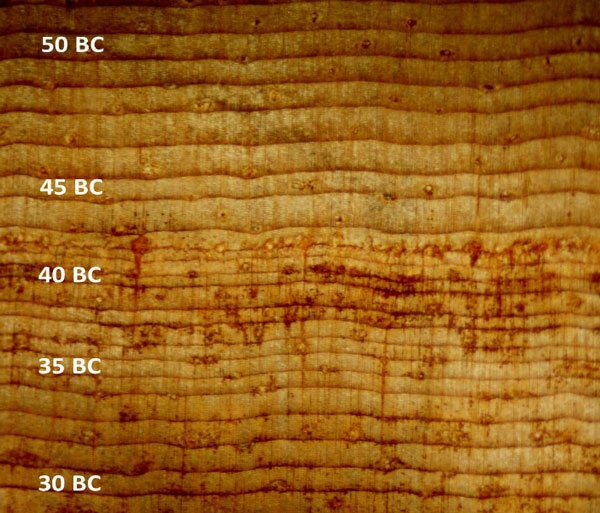 The narrow and irregular growth rings in the middle of the picture shows a year of extreme cold after a violent volcanic eruption in the year 44 BC – the year Julius Caesar died. (Credit: Matthew Salzer). Trees also contain annual information on past temperatures. The thickness and density of each annual tree-ring depends on how warm or cold the summer was, and in this way, they provide temperature records from e.g. Europe spanning the last several thousands of years. After large volcanic eruptions the climate becomes colder because the ash clouds in the atmosphere blocks the Sun. But when exactly did the eruptions take place? What climate effect did they have in Europe and globally? 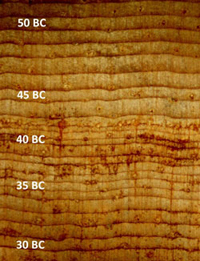 These questions have been difficult to answer since the two timescales – from the ice cores and annual tree rings respectively did not fit perfectly together. A new interdisciplinary collaboration between research institutions in the United States and the University of Copenhagen in Denmark among others has managed to sort out the conflicting information. Using new data and a new method, it has now been possible to date the past volcanic eruptions with great precision. The reconstruction is based on data from more than 20 ice cores from both Greenland and Antarctica and the study is therefore very reliable. 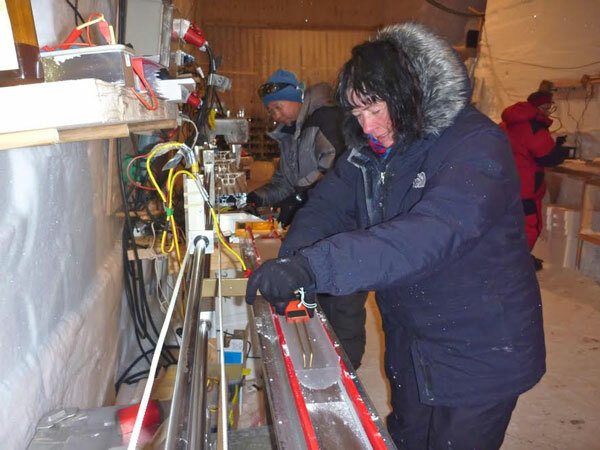 Dorthe Dahl-Jensen, researcher and leader of the NEEM drilling project, Greenland, records the acidic content in the NEEM core by measuring the electrical conductivity across the ice core. The measurement is carried out in the field. (Credit: Kenji Kawamura). The new data makes it possible to count years in the ice cores just like you can count years in tree rings. This task used to be done manually, but researchers at the Niels Bohr Institute have developed a method to do it using a statistical algorithm. In this way the researchers were able to reconstruct the volcanic activity from year to year over the last 2,500 years based on data from more than 20 ice cores from both Grenland and Antarctica. “With the newly developed timescale, we can see that the ice cores previously had been dated incorrectly by up to 10 years during the first millenium and this caused problems when they tried to compare the volcanic eruptions with their climatic impact seen from the climate archive of the tree rings,” says Mai Winstrup, PhD from the Niels Bohr Institute at the University of Copenhagen and now working at the University of Washington in Seattle. With the new timescale, historical crop failures and famines can be related to the prolonged cooling caused by volcanic eruptions. Large volcanic eruptions may have also caused epidemics and hardship and decline of agrarian societies. Volcanic ash particle from the NEEM ice core, Greenland. 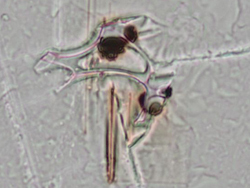 This ash particle was found at a depth of 327 meters, equivalent to 536 AD. 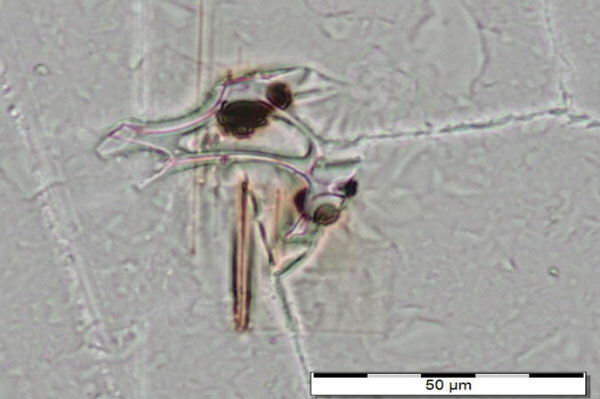 Analysis shows that it came from a volcano located along the west coast of North America. (Credit: Gill Plunkett). 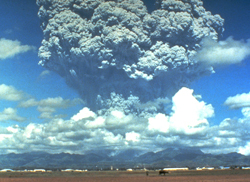 Francis Ludlow, historian from the Yale Climate and Energy Institute, examined historical written records for clues that might indicate volcanic activity. 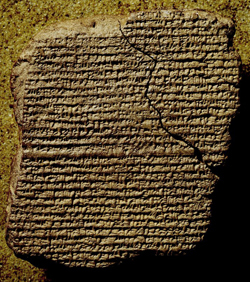 Ludlow translated and interpreted documents from China, Babylon (Iraq) and Europe, which told of unusual atmospheric observations, such as periods with less sunshine or deep red sunsets, which could be due to volcanic ash in the atmosphere. By comparing the ice core data with historical documents, the researchers found that volcanic activity was the cause of one of the most serious historical climate crises, the cause of which has been much debated. From March 536 AD, a ‘mystery cloud’ was observed over the Mediterranean for 18 months. The study shows that this was an ash cloud from a large volcanic eruption in the high northern latitudes, which caused generally colder temperatures throughout the northern hemisphere. 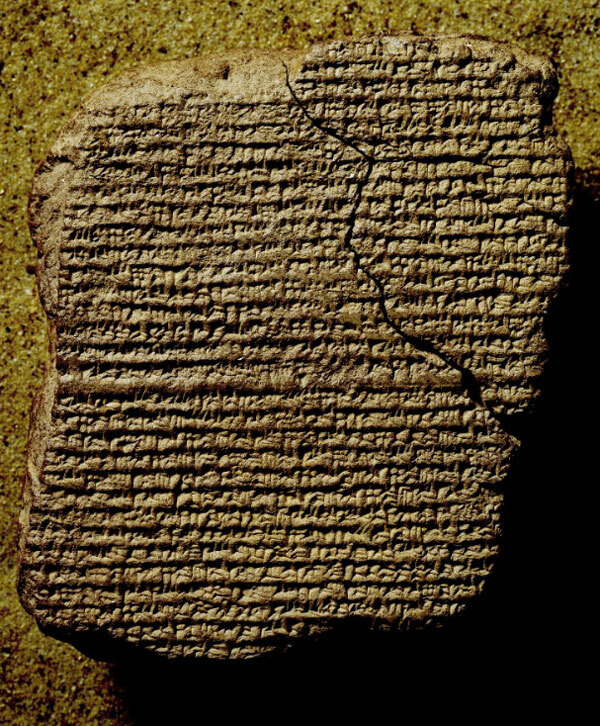 : The clay tablet is a Babylonian (Iraqi) astronomical diary. It mentions the observation of Halley’s comet in 164 BC as well as atmospheric events, such as a darkened sun caused by a volcanic eruption in 254 BC (Credit: British Museum). Michael Sigl, Desert Research Institute, Reno explains that this cooling intensified when a tropical volcano erupted 4 years later. In combination, these two volcanic eruptions caused unusually cold summers across the entire northern hemisphere lasting for almost 15 years and resulting in widespread famine. They may also have contributed to the outbreak of the Justinian Plague, which spread throughout the Eastern Roman Empire in the years 541-543 AD and reduced the populations of the Mediterranean and the Middle East dramatically. Climate variations in a larger time perspective The newly–reconstructed history of volcanic activity shows a relationship between the resulting relatively short-term climate variations and the ups and downs of civilisations. In this way, they can also provide a background for looking at the current climate variations in a larger perspective. “We have gained a better understanding of the importance of volcanic activity for climate variations, and we hope that it eventually will lead to improved climate models that are able to better account for the effect of this,” says Dorthe Dahl-Jensen.